As we can all see from the spoiler-filled trailers of the film, it’s Terminator 1 to 3 all over again but with the third and fourth instalment completely ignored. Cyborgs from the future have time-travelled back to the past once again to prevent John Connor, the leader of The Resistance against Skynet, from existing. Directed by Alan Taylor (Thor: The Dark World) with the script written by Patrick Lussier (Drive Angry, Dracula 2000) and Laeta Kalogridis (Shutter Island), can this recycled idea be any better than the previous sequels? Well it does have some of its own twists, but the simple answer is no. In the year of 2029 where the grownup John Conner (Jason Clarke) is planning an all-out attack on Skynet, he finds out it has finally come to that point of time where Skynet sends T-800 (the younger-looking Arnold Schwarzenegger) back to 1984 to kill his mother, Sarah Connor (Emilia Clarke), just like how he knew it would happen after the events of the original film. 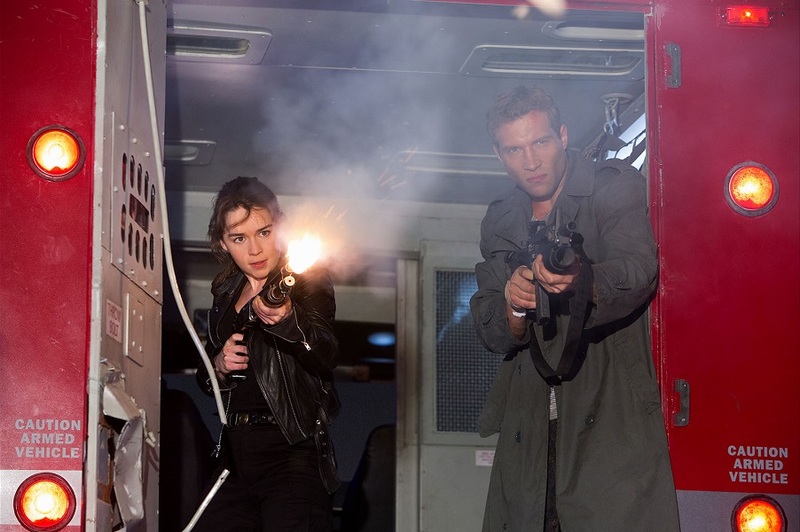 John follows the inevitable destiny and sends Kyle Reese (Jai Courtney) back to that time to protect Sarah. They expect her to be clueless, weak and terrified (like in the first film) but it turns out that everything in the original timeline has been drastically altered. Sarah is now already well trained and prepared with the help of another T-800 (the older-looking Arnold) that was been sent back to 1973 to save the 9-year-old Sarah from a T-1000 (Lee Byung-hun). There are a lot of time paradox and flaws like in the original films, that’s for certain. For example, how is it possible for John Connor to send his own father back to fall in love with his mother if he hasn’t existed yet in the first original timeline? Or why doesn’t Skynet just send an army of Terminators back to the same time to kill the Connors instead of sending them one by one? But let’s just put all the plot holes and flaws in the franchise and this film aside, even when it seems that the film is accidentally pointing them out as though they’re not aware of them. The film has a pretty acceptable excuse for sort of a reboot to the franchise and in overall, it’s still quite entertaining as a generic sci-fi action film with a cliched ending. The film doesn’t have same dark and gritty tone that the original had, and the action sequences are unengaging, nothing new, and we already know how it’d go — none of them will be dying, at least not until the final third of the film. Car chase, shotguns, explosions, robot beating robot through walls, Arnold struggling against more advanced Terminators, I mean come on! It’s 2015, shouldn’t they know it’s time to get creative and come up with something we’ve never seen before? It doesn’t seem that the CGI has improved either. The movement and appearance of the robots are quite unconvincing. Apart from Arnold, none of the actors from the previous films returned to reprise the familiar roles. 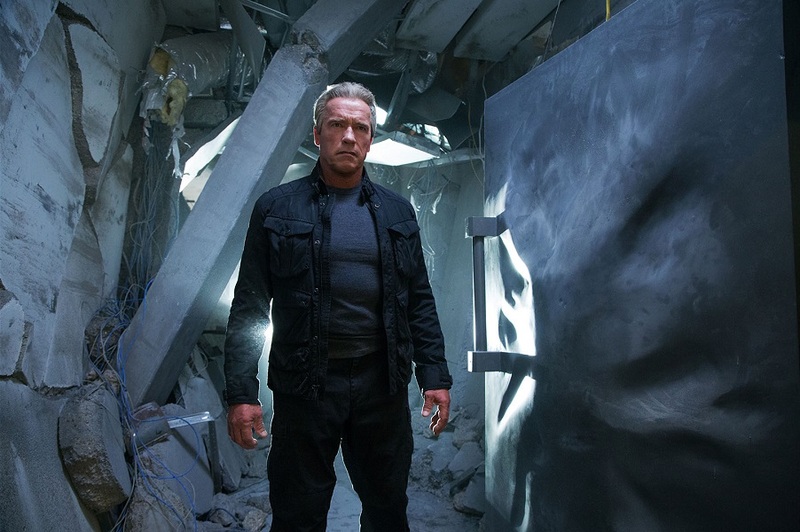 Arnold is practically irreplaceable as the T-800 and is still the most entertaining element of the franchise. This time, he’s given more almost-emotions, comic relief moments and father-like personality, which is quite cheap compared to how it’s done before. The other problem is that he may have killed some people in a scene when he’s strictly programmed not to. I guess that’s one of the many flaws in the film that I suggested to put aside. I do, however, like how they answer the critics of Arnold being too old for the role by making him look even older than he is. In the film, it’s explained that the Terminators’ skin tissues age like normal human beings’. The T-800 has been like a father figure to Sarah ever since, hence calling it “Pops”, but it’s never revealed who exactly sent him. All we know is that he’s able to build a time machine in the 90s, but the most advanced Hybrid T-3000 can’t in 2017. 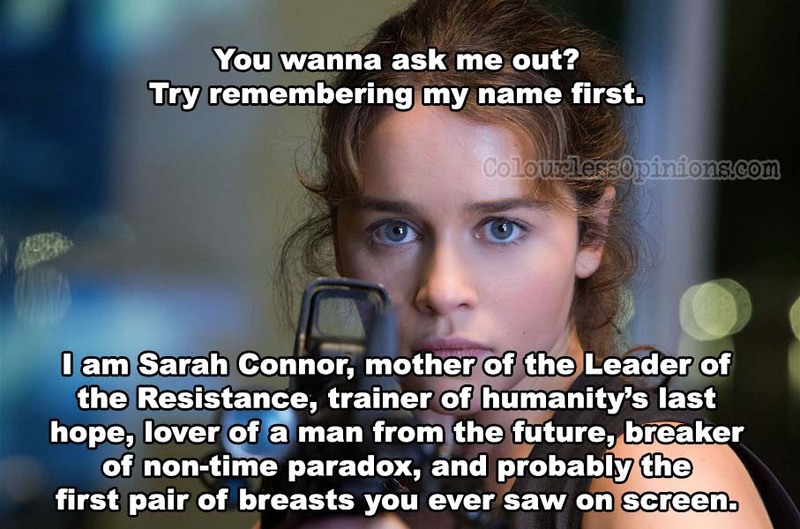 This version of Sarah Connor played by The Game of Thrones TV series’ Mother of Dragons, Emilia Clarke, is basically like the crossover of the same character in Terminator 2: Judgment Day (1991) and the John Conner in Terminator 3: Rise of the Machines (2003), who’s energetic, tough, attached to the T-800 and looks way more youthful than Linda Hamilton, the original actress who portrayed Sarah Connor in the first two films. Clarke is perhaps the only actor in the film besides Arnold who’s easily likable due to her performance, charm and character. But due to the pacing and script, the film lacks of proper emotional development, hence making the unlikely relationship between Sarah and Pops not as moving compared to the second film between John and that T-800. Jai Courtney (Divergent trilogy, The Water Diviner) may a bit too buff for the role of Kyle Reese, but at least he did his best maintaining the same protective and straight personality of the original. Too bad the tone and the script have made the character seem less serious than it should be. Also, Kyle’s romance with Sarah here feels like sexual tension than actually falling in love. As it’s already shown in the trailers, John Connor himself is turned into a Terminator, a Hybrid T-3000, and is sent back to the past to ensure that Skynet goes online as it does in the original timeline. It’s one of the very few new twists added to the storyline and it could’ve been a great, brutal idea to turn humanity’s saviour into Skynet’s last hope instead but somehow the film fails to make it seem like it’s a huge heartbreaking deal. Jason Clarke (Child 44, Dawn of the Planet of the Apes) is limited to playing a rather cliched come-join-the-dark-side antagonist but he also lacks of the presence that’s much needed for the legendary figure. What I really hate about this film is how they made the T-1000 so incompetent, disregarding the more thrilling struggles of the characters in the original films. 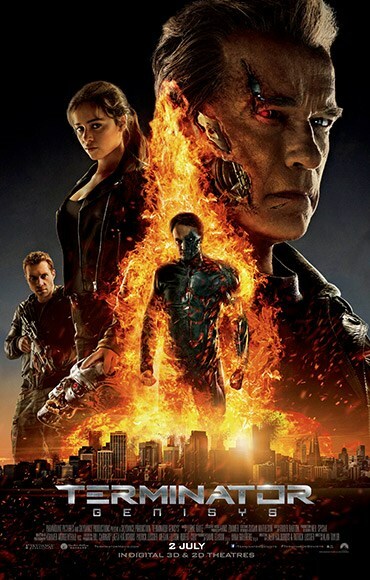 James Cameron, the director and co-writer of the first two films, said that Terminator: Genisys is extremely respectful to the first two movies, and officially considers it the third film of the series. Really? Post-credit scene: Basically what it shows is that the producers want to continue to make more money through this franchise without ever making a good post-James Cameron instalment. Malaysia censorship: I didn’t notice any sudden jumps and sadly, since it’s rated PG13, I doubt there’s anything to cut at all. To watch in 3D? I watched it in 2D at TGV so I’ve no idea if it’s recommended or not to watch in 3D. But judging by the cameras used according to IMDb, I believe the movie was only converted into 3D format in post-production so the effects won’t be great anyway. Second opinion: My girlfriend, who hasn’t seen the T1 and T2 yet, said she finds it okay and made her feel like crying in a couple of scenes. Verdict: Only those who haven’t seen the first two films (and can’t notice obvious flaws) may truly enjoy it.